The navy blue deluxe long bib apron is a full 23" x 30" with an adjustable neck strap, two patch pockets and extra long waist ties. Made of a 65/35 polyester/cotton twill with sturdy bar tacking at all stress points, this apron is perfect for restaurants, schools or cooking promotions. Embroidery, screen printing, laser etching and pad printing available - 6" x 6" above pocket and 3" x 3" on the pocket. Quantity discounts available starting at 12 pieces. Price shown is for the blank item only and does not include decoration. Navy blue deluxe long bib apron is a full 23" x 30" with an adjustable neck strap, two patch pockets and extra long waist ties. 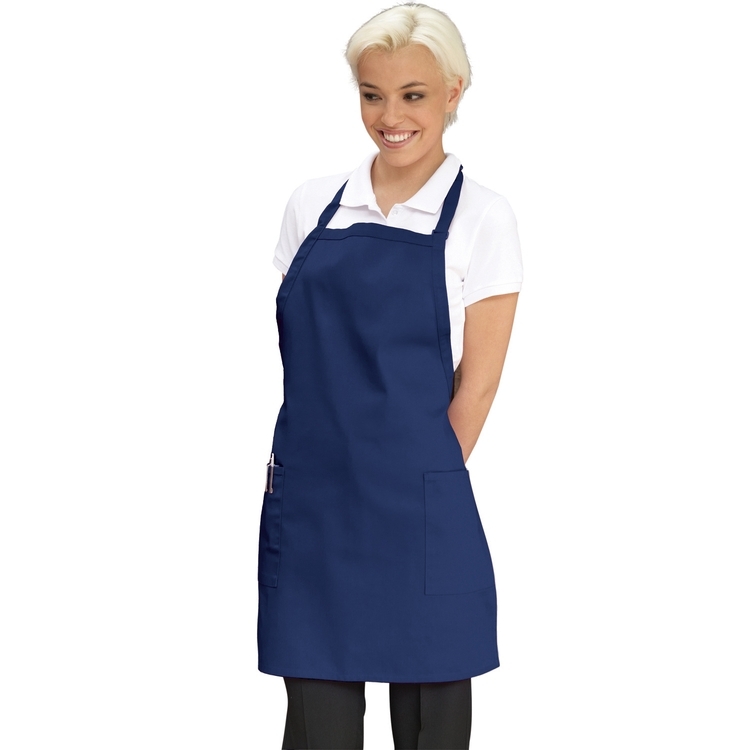 Made of a 65/35 polyester/cotton twill with sturdy bar tacking at all stress points, this apron is perfect for restaurants, schools or cooking promotions. Embroidery, screen printing, laser etching and pad printing available - 6" x 6" above pocket and 3" x 3" on the pocket. Quantity discounts available starting at 12 pieces. Price shown is for the blank item only and does not include decoration.